The timeline, style sheets, and videos explain the different styles and help you identify them. 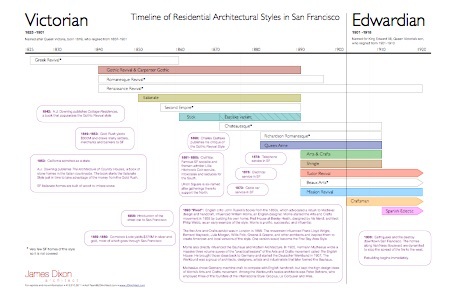 Click on the image to download the pdf of the timeline and style sheets. The timeline sheet is 11 x 17, the style sheets are 8.5 x 11. Scroll down for videos of each style within this period. These videos are High Definition. For full screen view click on the expand button at the lower right corner of the YouTube window, then click play. You can pause the movie to read the captions and study the pictures, then click play to resume. Click the esc key to return from full screen to this page.